Engineers in Rio de Janeiro examining the structural damage to Estádio Olímpico João Havelange have warned that it could take them up to two months to find a solution. The stadium, which is due to host athletics, and probably rugby sevens, during Rio de Janeiro 2016 Olympic Games was “closed indefinitely” this past week by the city’s Mayor Eduardo Paes after he was told that there were safety fears over its roof. 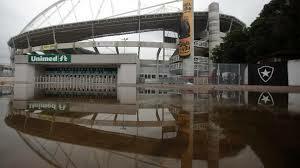 Structural problems with the Rio de Janeiro Olympic stadium opened in 2007 have closed it indefinitely. Armando Queiroga, President of the city Government’s public works department, RioUrbe, said solutions are being sought for the stadium, which has a capacity of 46,000 with plans to increase seating to 60,000 for the Olympics. Authorities warned the roof could present a risk for spectators if the wind reached over 63 kilometres per hour, or 39.15 miles per hour. The stadium, nicknamed locally Engenhão, due to its location in the Engenho de Dentro neighborhood, is currently home to local football club Botafogo. The architects behind the design have been named: Carlos Porto, Gilson Santos, Geraldo Lopes and José R. Ferreira Gomes, though their work is not thought to be at fault. Some architects are blaming the problem on the fact that the stadium, which cost $192 million, was finished only a month before the start of the 2007 Pan American Games, which it had been built for. Paes vowed to punish those responsible for the sloppy construction job. Meanwhile, International Olympic Committee (IOC) organizers in Brazil said they have “full confidence that the city of Rio de Janeiro will take the necessary measures to guarantee that the Olympic Stadium is ready” for the games and test events. In addition, Rio 2016 tried to reassure people that the problem would not affect the Olympics and Paralympics. “The Rio 2016 Olympic and Paralympic Organizing Committee has full confidence that the city of Rio de Janeiro will take the necessary measures to guarantee that the Olympic Stadium is ready for the Games more than three years from now, as well as for the test events before them,” they said in a statement. Next articleTokyo 2020: Hugely Impressed or Lost in Translation?